Target Liberty: Donna, I Have a Subtitle!! Donna, I Have a Subtitle!! 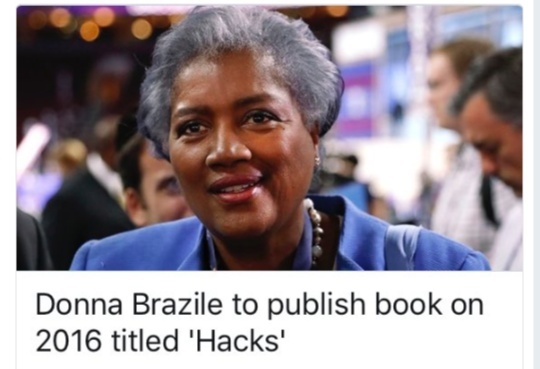 Donna Brazile will celebrate the one-year anniversary of President Donald Trump’s election with the publication of her book “Hacks: The Inside Story of the Break-ins and Breakdowns that Put Donald Trump in the White House,” Politico reports. Hacks: The Inside Story of the Break-ins and Breakdowns that Put Donald Trump in the White House, Despite My Efforts to Get Hillary Elected by Providing Her With Presidentia Debate Questions in Advance. Based on the title, I expected a tell-all confessional. Hacks: The Inside Story of Big-time Party Operatives and How We Got Outhustled. What a nasty snake. Either mentally ill, mentally retarded...or just evil?